In Station Number 6 of the Livermore - Pleasanton Fire Department, in the city of Livermore, California, hangs a light bulb. At first glance, you’d think it was a normal light bulb. Look a little closer, and you’d see its rather strange design. But not even its unusual appearance would give you a hint as to what makes it really unusual. 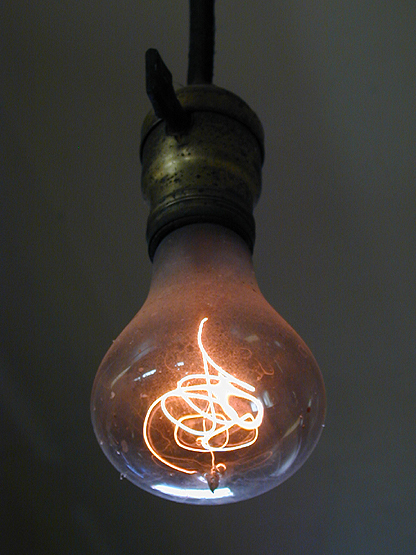 The light bulb holds the world record for the longest continually-burning light bulb in the world. And you’re not going to believe me when I tell you how long, so just go ahead and take a look at the bulb's webcam now. No kidding, the bulb has outlasted at least one webcam. Though, when you consider that webcams, or the internet itself, didn’t exist when the bulb started burning, that’s probably not all that surprising. For that matter, cameras were quite a novelty back when someone first screwed in this particular light bulb. The light bulb in Station Number 6 of the Livermore - Pleasanton Fire Department is called the Centennial Bulb, but that, of course, isn’t really accurate. Actually, the Centennial Bulb just celebrated its 110th year of continually giving light. The bulb has actually hung in at least three different firehouses in Livermore over the years. Its unusual appearance comes from the fact that it’s a “Shelby bulb,” manufactured by the Shelby Electric Company and invented by Adolph Chaillet sometime in the late 1800’s. It has, apparently, been turned off a few times since it was first switched on in 1901, but for the most part it has been giving light continually since then. Think about that. World maps have been redrawn over and over in those 110 years. The US has added five states. Most of today’s most successful companies didn’t even exist. When the light was first turned on, it was one of only two or three electric lights in the town of Livermore. The light started burning 8 years before my grandfather was born. The Centennial Bulb doesn’t look to be overwhelmingly bright. You likely wouldn’t want to read by it for very long. It’s strength isn’t in its brightness, but in its consistency. Would that we’d all give light so consistently for so long. As a metaphor for people who followed him in anticipating the Kingdom of God, Jesus settled on “light of the world.” Among people who too often seem to be stumbling in the darkness, Jesus said that we’re to be light - light that can’t be hidden, light that shouldn’t be hidden. It should be discernible in us no matter where we are or what we’re doing, and it should touch the shadows and remind those cowering there that there’s an alternative to darkness. “Everyone in the house” should be able to see what they’re doing because of us, he says. And the good works that we do and the good words that we speak will ultimately bring praise to the God who makes us light to begin with. It isn’t a matter of how brightly we burn, but how consistently. The world doesn’t need any more garish, glaring lights calling attention to themselves. What the people around us need, instead, is a light so steady that it makes them say, “Wow, who made that light?” They need people who are radiant with righteousness, justice, love, grace, mercy, and peace. They need people who glow with the light of God’s word and the hope of his promises. The people around us need to see that we shine in whatever circumstances. They need to see us radiate joy and faith and good works at all times, lights that illuminate their offices, schools, homes, and neighborhoods. As that little bulb has shone for over a century, regardless of the momentous events going on around it, so God’s people “shine like stars in the universe as (we) hold out the word of life.” We’re under no illusions that we’re in control of those events. But we know we can push back the shadows while they’re happening. There is no shortage of heat sources in our world. Heat we have in abundance, and then some. There will always be those who mistake the heat of violence, conflict, anger, vengeance, and pride for light. God’s people, from time to time, have even been known to make that mistake ourselves. But light attracts, while heat repels. Light clarifies, while heat obscures. Light offers refuge, while heat promises danger. Light brings people together, while heat drives them apart. Make no mistake, Jesus says that those of us who look for the culmination of the Kingdom of God in him are light. If we’re true to our identities as God’s people, light is what we are. It’s not anything in us, any more than the source of that bulb’s light comes from within it. But without the bulb, the power behind the light couldn’t be seen and experienced as light. We don’t have it in ourselves to be light for the world, either. But God is at work with us and in us to make us shine exactly where and how he wants us to. So may we be aware of what we are. May we be faithful to our calling of shining in the world. May we never hide the light that radiates from us in Jesus, may we never shroud that light with our own self-centeredness, or hide it under our own will or the fear that it will be misunderstood. We’ve been re-made in Jesus so that we can shine in exactly those times when light is most needed. May God’s power and grace be with you as you shine for him. May your light last for a century or more. And, when you’re done shining, may the Lord take you to your place at his side, where you’ll shine forever with the glory of the risen Jesus. another good one. i like how we are but the bulb, yet "God is at work with us, and in us to make us shine exactly where & how he wants us." Thanks.